Why exactly, is the Mars Bomber sitting idle? – Laila Yuile on politics & life in B.C. Why exactly, is the Mars Bomber sitting idle? As a northern girl born and raised just north of Prince George, I can tell you firsthand how important first response to a wildfire situation is, just as many British Columbians are saying now. Once a fire is reported and the decision is made that it’s a situation that must be handled, the earlier crews and/or aircraft can tackle the blaze, the more cost-effective it is, and the safer it is for all involved. The Mars Bomber has for many years, been one part of an effective arsenal of fire -fighting in the province of BC, but last year the decision was made to stop their direct-award contract, and the Mars are sitting idle on Sproat Lake on Vancouver Island – much to the confusion of many who have seen the plane in action. The Mars is capable of a large payload of water and, in some situations, can knock back a fire with incredible effectiveness, yet it sits after years of service to the province. ” Despite it’s world-renowned ability to scoop up and drop 27,200 litres of water at time and a 53-year legacy of dowsing forest fires across North America, this year the provincial government opted not to renew its contract with Coulson Flying Tankers, the Hawaii Mars’ owner. Instead the province looked to Abbotsford-based Conair for aerial fire suppression, gaining the services of four smaller turbinepowered aircraft instead of the massive Hawaii Mars. Early into the forest fire season, it appears the situation in B.C. will be particularly serious this year. he cost of fighting these blazes is yet to be released, but as a relatively calm season drained $122.2 million of provincial funds, the 2014 forest firefighting costs should be enormous. According to Coulson Group of Companies CEO Wayne Coulson, the Mars bomber’s firefighting contract in 2013 amounted to $750,000, yet this year the province decided to go with Conair’s smaller, more modern aircraft for $1.8 million. After the deal was made Steve Thomson, minister of Forests, Lands and Natural Resource operations cited the bomber’s “operational limitations” with respect to performing multiple drop patterns in B.C.’s mountainous terrain. Hmmm.. who would be best suited to offer a knowledgeable perspective on the governments choice to go with the costlier contract to Conair? 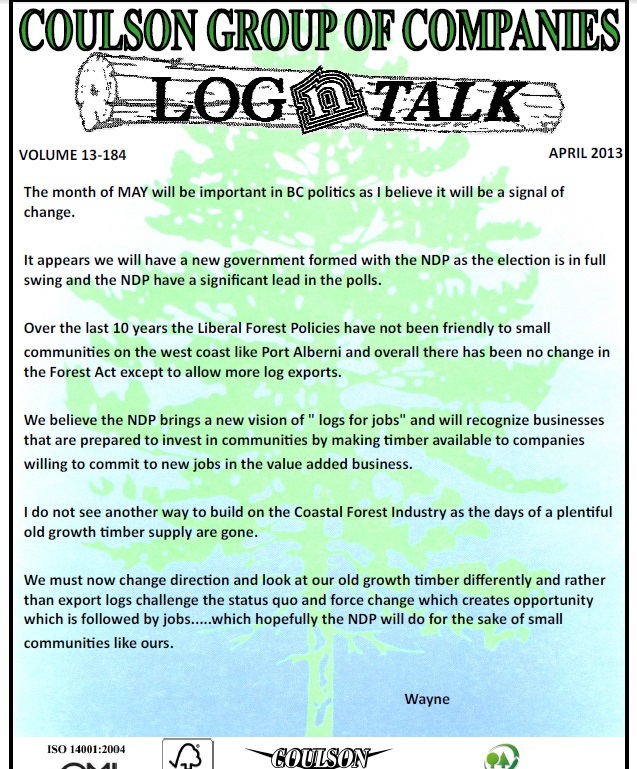 Incidentally, and I am sure, purely coincidental… it was the spring of 2013 when the owner of the Coulson group came out strongly against the BC Liberals prior to the election, and the poor Liberal forest policies that impacted small communities all over the province. Interesting that the election in May once again comes to the forefront. Wrong place for this comment. I suggest you send an email to all candidates if that’s a concern for you. It’s all politics, who knows who and who is going to get some coin in the pocket! It always has been! BC politics burns BC once again.? Thanks for this Laila. The Mars stands on its merits. Politics and favours trump facts evey time with this government. 15000 signatures and counting in only 4 days. Is there a parallel between Mr. Graydon’s leaving BC Lottery and going to work for a Casino enterprise and Mr. Berry leaving Government Service and going to work for a Forest Fire Suppression company? I would be surprised if Mr. Berry during his time working for Government didn’t have some contact with Conair [appropriate name] and mused about what he was going to do after life in Government. For the moment the term escapes me – something offered in the way of a benefit – breach of trust? I’m sure Mr. Coulson’s comments regarding Liberal policy and his criticism of the Forest practices did not put him in good standing with the re-elected Liberals. British Columbia – best politicians money can buy! Interesting column. Something you might also consider: The Mars needs to be on standby for coastal fires, where most of the consortium’s charters are. I don’t understand the thinking about the Conair being better suited for mountainous terrain—it’s LESS mountainous in the Interior than the coast. The Mars are remarkably manoeuverable despite packing three times the payload as the Conair DC-10. I used to live on Sproat Lake, right across from the Mars hangar. Must’ve seen it land and take off hundreds of times over the years. Even felt the spray falling off it’s huge underbelly as it occasionally coursed over our dock. The vibration of the engines is palpable even miles away. It has the illusion of impossibility: how can something that big fly so slowly? we often wondered. I guess time kind of stands still when watching it take off—it actually has to be doing at least 120 MPH to get airborne. We sailed a boat under one of its wings one time; they’re truly huge! Laila – as a fan of your work I beg your forgiveness for the sin I am about to commit but as an aviation nut with several hours of flight school under my belt I feel I am able to contribute something here – albeit contrarian in this instance. The Mars aircraft were originally conceptualized as amphibious troop transports (much like the infamous Spruce Goose) with the idea of moving hundreds of troops from the pacific coast to Hawaii during WWII. While the Mars would have been faster than ships it was ultimately determined the concept wouldn’t have been as cost effective or efficient. All told, the aircraft would burn more fuel per man per mile than a ship, and lots of planes would be needed to carry the same number of troops. When fully loaded the aircraft would also be forced to fly rather low where it was even more fuel inefficient, and where it was conceivably more vulnerable to small arms fire from Japanese attack boats or subs. Parts of the tail of the Mars are actually covered in fabric to lighten it up. While that was a fairly common construction technique early in the war, it fell out of favour by the end of the war. All this is to say that the aircraft was dead on arrival in terms of a future in the military. Years later, after a few different owners, two Martin Mars aircraft were converted to water bombers and found their way to Port Alberni and Sproat Lake. This was actually a sort of post-war aviation trend in itself. Many surplus large bombers and transports were being sold off by the US government and were being repurposed in civilian hands for a variety of roles. Many B-17 Flying Fortresses actually found second life as water bombers in the United States and elsewhere, as did a variety of Grumman light bombers from WWII, Korea and Vietnam (CONAIR’s Firecats are actually repurposed Vietnan era light bombers, but even with newer engines, CONAIR has been slowly retiring them as their airframe hours are now high, and parts increasingly sparse). In any case, if you’ve ever seen it, the Mars aircraft are impressive to watch. They are big and can drop a lot of water. There is also a high degree of nostalgia surrounding these airplanes (myself included – I hope one ends up in a museum somewhere). This is where I feel the truth starts to get lost. My first encounter with a Mars in action was during the second fire in Burns Bog just over a decade ago. I was covering that blaze as a freelance reporter – and my brother was part of the initial attack crew on the ground. The Mars wasn’t called in for a day or two and then as numerous times since, people were bitching and moaning about it on the radio, in print and on TV – myself included. I spoke to one of the captains on the ground and he laid it out for me. He said it’s impressive to see, but not always practical. The turnaround time between drops he told me could be an hour or more. He said they were able to use it at Burns Bog that day because it happened to be returning from service elsewhere but he said he was rather indifferent as to whether they got to use it or not. Fact is he told me, it’s also not always that accurate (not to disparage her crew), nor is water the best way to fight a wildfire. He said he prefers multiple, pin-point drops of water or retardants. He said often the water just boils away on the hot fires and it’s effect is only temporary whereas the red retardant actually changes the chemical composition of the fuels it lands on and generally works regardless of the temperature of the fire. But he reiterated the single biggest drawback with the Mars is that often, only one was available, and the times between drops were just too long. He said the Mars was good when the fire was at a lower elevation than the water source but in BC, that wasn’t often. When fully loaded, the climb rate of the Mars is roughly a quarter what it is when empty. The climb rate is reduced further when operating at higher elevations like in the Interior or Okanagan. This means once the Mars scoops up it’s water, it takes a while before it is able to climb high enough to safely clear obstacles like mountains. It’s mission suitability is further challenged by the size of body of water it needs to complete a pickup. The Mars needs a long straight run across a fairly large body of water. This rules out a lot of perfectly good sources of water often much closer to the fire. In the hour or more it can sometimes take between Mars drops, bucketing helicopters can deliver with greater accuracy dozens of drops in steeper, tighter terrain, for much cheaper. Smaller bombers like Bombardier’s CL-215 or similar, while not as quick on the turnaround as the helicopters, are able on average to do half a dozen drops in the same amount of time as a single Mars drop. They can also operate from both paved runway or water and can elect to fill their tanks with retardant instead of water offering more versatility. The other major drawback of the Mars is simply it’s age. Old airplanes can and do fly but they require more and more maintenance and perhaps more importantly, part availability. Coulson’s two Mars aircraft (now down to one I believe) are the only examples/example of the type still out there, meaning many replacement parts for it’s engines and other structures and systems are scarce to none. To get around this, Coulson’s has an impressive machine shop that makes it’s own parts where they can, or reconditions the originals for as long as they can. In aviation however, making your own parts or reconditioning old ones isn’t as simple as that. For each part that is not original, a rigorous testing and certification process exists with flight safety regulators not just for the part itself, but the production process and training of it’s makers. For a growing list of parts, there are no longer replacements available, Coulson’s made or otherwise. There are no boneyards of dead Mars bombers to pick from like there are for some of the older aircraft operated by CONAIR. The Mars shows it’s age in the field with frequent leaks, busted parts, warning lights etc. This happens often enough that for Coulson’s to be able to live up to its contract that has stipulations about mission readiness, when the Mars is called out, the machine shop is loaded up into trailers and driven to the theatre of operation. A few years ago when Coulson’s was contracted by the Mexican government only one Mars was able to make the trip as the other was out of service for engine and structural maintenance. The one that went suffered an unexpected and lengthy delay in California after a Canada Goose struck the fabric covered tail doing structural damage. The plane had to sit and wait for the trucks to catch up (a day or two)and then engineer a fix far away from home. Once in Mexico the plane was delayed once or twice with engine oil leaks…and then there was the turnaround issue. A suitable water source was 45 minutes from the fire…each way. There’s actually a documentary made for Discovery Channel about that mission out there somewhere. I recall it went to great lengths to sugar coat the challenges the crews faced on the Mexico trip. The crews at Coulson’s have worked hard to maintain the Mars aircraft and have kept them flying far longer than anyone thought possible; but they’ve been at the end of the line now for the better part of a decade. I heard anecdotally that Coulson’s had been sniffing around some used C-130 Hercules transports up north in recent years and that they were considering transitioning – but I don’t know what has become of that. I think the real question now regarding the future of the last Mars is what museum it should reside in. It needs to be in one – in Coulson’s colours! *The Mars taken out of service is now at a museum in the Eastern US but in it’s original US Navy scheme. Slight correction. They were originally conceptualized as flying boats rather than with amphibious ability. Hmmm. Interesting because I am a bit of an aviation buff as well… I absolutely get the nostalgia associated with the last of these workhorses of aviation: there isn’t much out there in modern, computerized aviation that is comparable to these planes. However, maintenance issues aside, which I totally get, these behemoths deliver a payload like none other, and as reported by several outlets,have been crucial to fighting fires in British Columbia Brett. Considering all the evidence to the contrary that the Mars is ineffective… I wonder what whether or not politics and influence in this case, has trumped public safety. B.C’s forest industry has evolved drastically since 1960. Much of the first growth old timber is gone as are many of the companies that pioneered the industry. Companies have merged, some simply have disappeared. MacMillan Bloedel, which itself was the result of an earlier series of corporate mergers and acquisitions, ceased to exist in 1999 when it was acquired by the American giant Weyerhaeuser. New legislation, government policies and changes in forestry practices have had an impact on the status quo and the owners of the Mars ultimately could no longer justify its expense. The aircraft were put up for sale in 2006 and bought in the spring of 2007 by the Coulson Group, which has deep roots in the Alberni Valley. In 2009, Coulson installed a Garmin EFIS Glass Cockpit system in Hawaii, consisting of two Primary Flight Displays (PFD) and two Multi-Function Displays (MFD). The PFD screens display aircraft details and Synthetic Vision while the MFD screens display GPS, Terrain Avoidance, Traffic Collision Avoidance (TCAS), and XM Weather data. Coulson’s birddog for the Mars is the S-76 Firewatch helicopter, equipped with a Honeywell EFIS Glass Cockpit, certified for single pilot IFR operations. The helicopter has a full Air Tactical Group Supervisor (ATGS) radio package and plugs for agency radios. The rear cabin has seating for six, a 26-inch HD TV and a full electronics and data suite. Coupled with the HD video and IR cameras mounted under the nose of the helicopter, Firewatch is an airborne command and control centre. In 2010, the B.C. Ministry of Science and Technology recognized Coulson’s foresight in aerial firefighting by awarding its annual Innovation Award for the work on the Mars and Firewatch, “which transformed an aircraft destined to be a museum piece into the most advanced forest fire-fighting and urban interface/structure protection technology in the world.” In 2011, the technology was put to the test when the Hawaii went to Mexico as the feature of a Discovery Channel’s Mighty Planes episode. Flying from a lake that straddled the U.S./Mexico, Hawaii spent three weeks attacking out of control wildfires in northern Mexico, with Mexican officials riding in Firewatch and directing operations in real time. Last year, however, the province of B.C. announced that it would no longer consider the Mars as a firefighting resource, replacing it with four small single seat air tankers (SEAT), with no further explanation offered. When the news broke, the local community was outraged. John Douglas, mayor of Port Alberni, describes the Mars as an integral part of the regional history. “It’s something that everybody here is really proud of and we feel that these aircraft are a part of us,” he says. Douglas received a unanimous endorsement from the Union of B.C. Municipalities to lobby both the provincial and federal governments to find a way to reinstate the Mars, but he has found little support for the aircraft at either level. I still have to disagree here. Adding the glass PFD, GPS and whatnot in the cockpit does nothing to address the airplane’s operational limitations. The airframe is old, the engines are old and parts for both are increasingly difficult to or impossible to find. I’ve followed closely the Mars march to retirement and honestly speaking – I am surprised they remained in service as long as they did. I would also argue the gallons per day numbers game is a flawed one. It doesn’t account for the accuracy of the drops, or evaporation rates. I was choppered into a blaze in 2007 near Logan Lake and got to see just how much more effective the combo of heli bucket drops and tanker retardant drops are. On the side of that slope I watched as helicopters were able to source water from a pond a mere 100 feet from the front line, fly sideways and dump right on target in 30 seconds. With two heli’s working at opposite sides they were able to hit the front line twice a minute. It’s an extreme example but it still stands in my memory having seen both methods in action. With only one Mars remaining flight ready – their operational capabilities are for all practical purposes severely limited. Signatures on the petition are really a red herring here too. The general public isn’t at all versed in this stuff. I’m told on this wildfire stuff it is a little counter-intuitive…big single drops just aren’t as effective as smaller, strategically placed chemical drops. Coulson’s has seen the writing on the wall for years too and have engaged in a bit of propaganda of their own in order to justify their continued relevance (and contract stream). The BC Liberals can and do engage in the type of shenanigans they stand accused of here – I just don’t think they do in this particular case. This is something that had been coming for a long time – pre-dating the BC Liberal government even, and Coulsen’s has been well aware of it. I need to learn the proper spelling of Coulson’s! Apologies. Anyways – I think there’s a lot of mythology regarding the effectiveness of the Mars in BC. Not to say it hasn’t been effective in fires past as I’m sure there are tons of examples where it was great…but I’d be willing to bet behind all those stories there are a set of circumstances where the mission requirements were suited to the plane. Ie…big, long water source at a higher location than the fire, closer proximity to the fire, etc. The Mars Bombers are 60+ year old planes that require a major engine refit ( as required by the Ministry of Transport) for every 100 HOURS of flight. The diminishing supply of spare parts, the “time on target” , the aging superstructure. All screams for a well deserved retirement in a BC museum before we see the “last” Mars self destructing into a mountainside on a You Tube video………. It also raises the question. Why arent there planes available that can deliver a similar payload over than old converted passenger jets ? Mr Google tells me that over 31,000 of the engines used in the Martin Mars were made. I suspect that replacement engine parts are an easy problem to solve. What other aircraft types are those same engines in? A crucial question because all those other types would have been picking from the same lot since the 1940’s. That said – I used to wonder how much time could be bought for Hawaii Mars if they did a turbo-prop turbine conversion. Then I considered the cost of a large turbo-prop unit times 4 and you could purchase a whole new aircraft before you even figured in the certification costs. Donor lobbyist giveaway at expense of public safety.? With the Cluck and her BC Liars weather modifying when it suits them, to destroy BC, how ’bout a wee bit of cloud-seeding for our almost dead forest industry….DUH, even Grade 12er’s would know this. If this doesn’t work how ’bout adding some water to the killer chem trails the BC Liars and the fed Cons are showering down on us 24/7/365. Does anyone else hear the cuckoo in here? Actually Jean. They are logging our ancient Douglas Firs near Port Alberni. Not even our Canadian National Parks are safe from, government greed either. No doubt those raw logs will also sail over to China as well. Canada has become, a cesspool of corruption and nothing is safe from Harper nor, from the Campbell/Clark BC Liberals. They even gave Poland, BC’s ship building contract. fires. Although, I believe the BC citizens, made it onto Harper’s enemy list. Nope, I guess that cuckoo can only be heard in YOUR head. Sorry julie I agree with Brett . You’ve been sniffing too many weather modified Chemtrails 24/7/365…. yeesh. RE the Martin Mars water bombers. I remember the Barriere fire north of Kamloops in 2003. I remember driving past what appeared to be a small fire the morning of the day it started and watching a lone helicopter working it with a tea bag, and thinking to myself that the powers that be better get on this fast before the afternoon winds pickup because of the heat. There were also a logging crew up there at the time willing and able to help put this fire out. They were told they weren’t certified or qualified to fight the fire and to stay away. The next day it was totally out of control and the resulting disaster that unfolded after was devastating. I was in Barriere, still intact, after a Kamloops radio station had declared it burned out. The sad fact of this debacle is that it could have been avoided if better decisions had been made. If the Martin Mars water bomber had been brought to this fire could it have been controlled and extinguished the day it started. The Mars, and there were two of them at this time, could have run off of Bonaparte Lake. This lake was about 10 minutes flying time to the fire. Both of these aircraft working this fire could have had it down in mere hours. Contrary to what the BC Forest Service was trying to pass off at the time these aircraft were available could have been on the job within a few hours. The Okanagan fire that destroyed a lot of East Kelowna started the same way. A little fire that was left to grow into a disaster truly showed the vast incompetence of the BC Forest Service and it Lieberal political masters. The Forest service is now saying that smaller aircraft that carry 800us gallons of water are going to do a better job than an aircraft (the Marin Mars) that carries 7200us gallons. So, these smaller aircraft with 800 gallons that will have to do 7 drops to the fire are better than one drop of 7200 gallons. I have watched Marin Mars work a fire and one huge drop covering about four acres is a lot more effective that a drop that will barely cool a house fire. They also have the ability to drop fire retardant at the same time. This aircraft is very effective when used, as they were first obtained for, to get the fire down quick right after it started. The people of Kelowna, that might lose their houses in the balance of the decision not to use the Mars, will very angry when they find that not all of the available resources, including the Mars, are not being used to fight this fire. The Mars, from what I understand, is a resource that costs about half of what the water fleas the Forest Service chose to use. In BC its not a matter if who you know it’s also a matter of whose palms you grease before anything happens, and this is a shinning example. Politics interfereing in BC with crown corporations/contracts/fires. At the end of the day who benefitted the most.? The Mars water bombers are amazing. I’ve seen them flying and working, just to watch them skim a lake and then unload…..nothing like it. When the Provincial government sold them, it did make me wonder about their common sense, as in none. Then they were used by anyone who could pay. Now they sit idle and some rinkie little puddle jumpers do the work? Oh, and suddenly after all those years of service in B.C. they aren’t good enough. Sounds like more of the Lieberals hot air. The safety of B.C. taxpayers lives and property is secondary. The Lieberals don’t care so much about the claims the insurance companies might have to pay out and the lives of citizens disrupted. its important that they and theirs gets. Just another e.g. of how well things work in B.C. like, run of the river projects, B.C. Rail sale, not so smart meters, the list goes on. The Mars water bombers can drop huge amounts of water, which can put out a fire very quickly. As I recall the last time Kelowna was going up in smoke, B.C. hadn’t contracted for them, they were in California. Nice shot of the prem though sitting on the steps with one of her displaced constituents. Maybe Gitxsan will hire Mars.? That Alberni Times story is a good back-story. Sounds like some favours are being done. Since every fire is different, and every location varied, it would seem logical to employ any and all means at disposal to fight those fires. The chosen method by the chosen company might not be the best in every situation. Chris delivered his petition to Christy Clark’s office in West Kelowna yesterday and was met by a dozen sympathetic onlookers and a hostile Global reporter. Coverage on Global News last eve was another opportunity to parrot the Ministry line, rather than highlighting the story behind the story or the possibility that the Mars be used when appropriate. Hostal global reporter body language might imply pre bias to story. There is sure a multitude of media/government based criticisms of the MM here…. Pingback: At what point does inaction become negligence? | No Strings Attached : Laila Yuile on politics and life in B.C. Pingback: 2015 ends with a bang… so it’s time for the Top ten posts of 2015, from LailaYuile.com | No Strings Attached : Laila Yuile on politics and life in B.C. Christy fiddles as BC burns! And here we are again back in the same situation where we watch our land and communities burn and politics holding back on where they put their resources. CC has 2 more days in office and she’s going to sit on her thumb and watch BC burn.